Use these quick notes to help you revise each topic from the Chapter. You can also download a PDF with revision cards to print double sided and 2 slides per sheet to get small cards to play revision games… Animated Science Physics AS Revision Cards Chapter 7 but the information is the same as on this post! If we say that an object is under the influence of forces which are in equilibrium, we mean that the object is not accelerating – there is no net force acting. The object may still be travelling – but at a constant velocity – but in most questions the object will be stationary. The following ideas will help you to solve problems that involve a body acted on by three co-planar forces. 1. The lines of action of the three forces must all pass through the same point. 2. The principle of moments: the sum of all the clock-wise moments about any point must have the same magnitude as the sum of all the anti-clockwise moments about the same point. 3. The sum of all the forces acting vertically upwards must have the same magnitude as the sum of all the forces acting vertically downwards. 4. 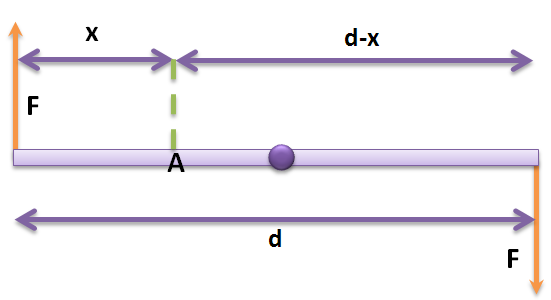 The sum of all the forces acting horizontally to the right must have the same magnitude as the sum of all the forces acting horizontally to the left. Scalars: A scalar quantity is very simply a numerical item such as 7°C or 5kg. It can be in any direction and other examples are mass, density, energy or volume. 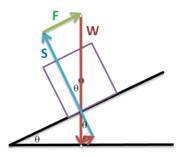 Vectors: This is a “scalar” which has a direction or bearing. This means that we can now think about displacement instead of distance travelled. This enables us to think about the motion of objects in more complex ways and define formulae with directions. Other examples are force, velocity, acceleration and momentum. Vector Equations: When applying Mathematics to Physics problems we find that a scalar such as mass converts one vector to another. F = ma where both “F” and “a” are vectors. 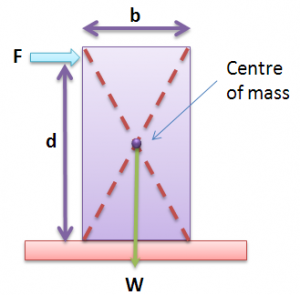 mass in kilograms (kg), and acceleration in ms-2. The units on both sides must be equal, so 1 N = 1 kgms-2. 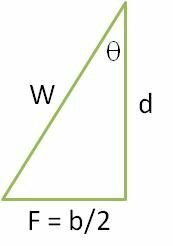 Vector Journeys: When we have a journey which consists of two vectors such as displacement we find that it adds up to form a triangle. We can then go direct or indirect. Vector Addition: If you have resolved all the forces, speeds or distances into their x and y components you can then sum all the x’s and all the y’s to find the overall motion. It is like adding lots of little effects to get one resultant or one large triangle. We can also do the same by drawing out the problem to scale. 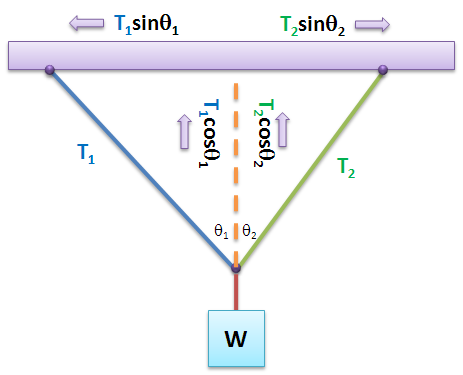 Vector Triangles: We find that if a vector triangle works for distances it can also mirror the situation with the forces involved. 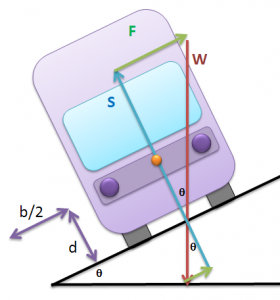 For example if we know the geometry of a car on a slope it will enable us to predict the friction or support forces acting on the slope if we know for example the weight of the car. Childs Swing: This seems complex but it is not if we think of the problem in balance. Imagine that dad is holding the child back ready to swing. All forces balance according to Newton’s 3rd Law. So the Tension in the rope of the swing must balance both Weight and the Pull force from dad. However, tension acts at an angle so we resolve the forces (or split them) into vertical and horizontal components. A common mistake is to get the placement of the 90° corner of the triangle. Also you should notice that there are three similar triangles on this diagram which can all be used to solve problems. See-Saw: When we have simple see-saw we can sum up by just balancing from the middle of the see-saw and add any Wd from the pivot point.. Couples: These are simple pairs of equal and opposite forces acting on a body which cause a turning force or “torque”. The more “torque” the harder it can push an object. Tractors have a lot of torque to pull loads. Racing cars have lower torque as they don’t need the same pulling force. We can take moments about any point on a couple. However, it is easier to do it about the pivot point if that is possible. It does not matter where you take the moments as the couple always comes out to be Fd Take look at this example taken about “A”.. 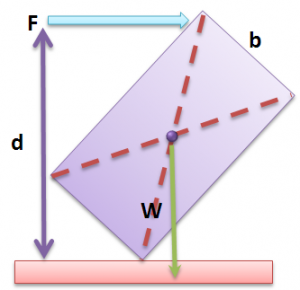 Single Support Forces: If we think about the pivot point in this prism supporting the weights acting downwards we simply summate the forces regardless of where they are acting. This can be used in conjunction with a moments equation as well. 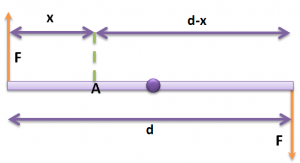 Double Support Forces: If we think of a simple table as an example the same principles of forces and moments applies. However, we must set up two equations for the unequal support forces. We have in take moments first from point X, then point Y to give us two equations. 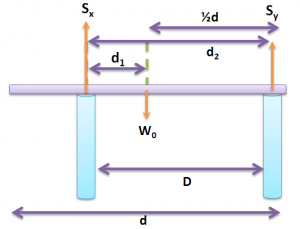 Unstable Equilibrium Calculations: We can use the dimensions of our problems and the theory of moments to setup an equation about the pivot point. 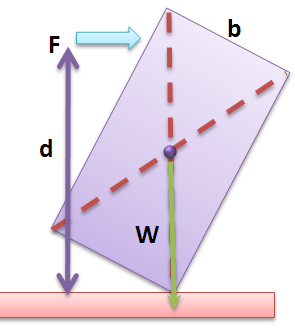 Weight acts through the centre of the base and the force acts a distance d up the side of the block. Toppling Vehicles: We also find trig and moments useful when deciding at which angle a vehicle will topple over on a slope. If we know the geometry of the centre of mass and middle of the base we can construct a triangle of an angle which creates the ratio of similar forces. The geometry causes the forces to act. Resolving Forces Parallel to Slope…. A Simple example would be a lorry has a wheelbase of 2.1 m and centres of mass unloaded of 0.7m from the ground. What is the maximum angle it can drive at before toppling over….